A solar panel is a device that uses energy from the sun and converts it into other forms of energy that humans consume for a variety of purposes. Solar panels utilize solar cells. A famous type of solar panel, also known as the photovoltaic panel, uses light energy from the sun and converts it into electricity. Another kind of solar panel is the solar thermal energy panel, which is a form of solar energy storage. And of course, one of the more popular and highly useful forms of solar panels is the solar hot water panel which heats water with energy coming from the sun. Solar cells are typically sandwiched between glass plates, but glass plates are heavy, fragile and inflexible. So, increasing attention is being paid to the construction of lighter, flexible substrates for solar cells. Textiles are appealing as flexible substrates in that they have a huge variety of uses, ranging from clothing and household articles to highly sophisticated technical applications. Textiles can be produced by a wide variety of processes, such as weaving, knitting, braiding and felting, and these processes offer enormous versatility for allowing a fabric to conform to even complex shapes. Not only can textile fabrics be rolled up for storage and transport and then unrolled on site; they can also be readily installed into structures with complex geometries. When light shines on a solar textile, the solar cells on the textile fabric convert some of the light into electricity. The main advantages of solar textiles in comparison with regular solar panels, solar textiles are lightweight, portable, robust, versatile and it provides flexibility. Although solar panels have become more streamlined over the last few decades, they still have numerous flaws - including their design and shape. Andrew and her team are currently coating different weave types and structures with a polymer that increases the fabric’s conductivity tenfold. Once fully coated, the fabric will serve as the bottom electrode, and a base layer on which to build the rest of the solar cell. Research at universities is the perfect breeding ground for innovation, but also bringing minds from all different disciplines together. At the University of Wisconsin - Madison, the energy team has partnered with a designer to bring a new look to solar panels. Marianne Fairbanks, assistant professor in the School of Human Ecology's design studies program also co-founded Noon Solar, a Chicago-based company that made solar-charging handbags. "I found myself on a campus full of brilliant people of all disciplines so I just googled 'solar research UW–Madison,'" Fairbanks said in a statement. Fairbanks teamed up with Trisha Andrews, an assistant professor of chemistry at UW, who is researching solar cells. According to UW, her latest research is developing an organic, dye-based solar cell that can be deposited on paper. However, Fairbanks' art background got the two working on a fabric-based solar cells. 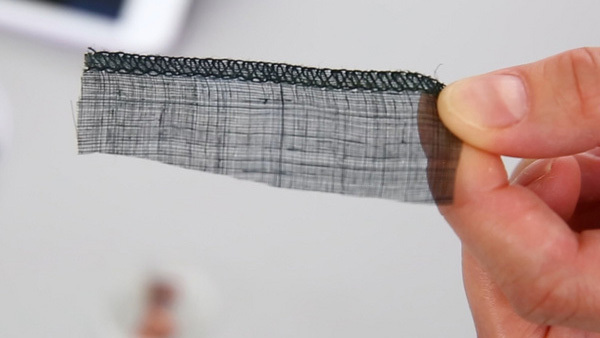 "The idea of building solar cells on fabric is potentially transformative," Andrew said. "If we take this technology to grow devices on material then we could talk wearable technology, as well as solar curtains, solar umbrellas, solar tents, or applications for the military." Andrews and Fairbanks are experimenting with different fabrics, and covering those with a polymer that can increase the fabric's conductivity. "Once fully coated, the fabric will serve as the bottom electrode, and a base layer on which to build the rest of the solar cell," the university said in a statement. Using textiles for solar is not a new idea, but Andrews said none of them began their research with the end result -- namely, commercial application -- in mind. "There's no one out there, there's no designer working with a device person trying to do this -- that's us -- and that's what really excites me about this project even today," said Andrew. "I thought that was brilliant," Andrew said. "I never would've thought of that. If we could literally weave together a solar cell: mind blowing. We're really integrating each step of the process, on the textile side, on the device side." The team hopes to have a functioning prototype one year from now to show how their different disciplines can be combined to make energy savings beautiful and functional at the same time. "Science and art aren't too different," Fairbanks explained of the project. "We're all experimenting. To get to do it together is a dream come true."